Thought Bubble 2015! | Thought Bubble 2018 runs 17th - 23rd September! Thought Bubble 2018 runs 17th – 23rd September! Welcome to the start of the countdown to this year’s Thought Bubble Festival! Our website has undergone its annual regeneration, and has come back new and improved, and now features the first batch of updates about this November’s events! 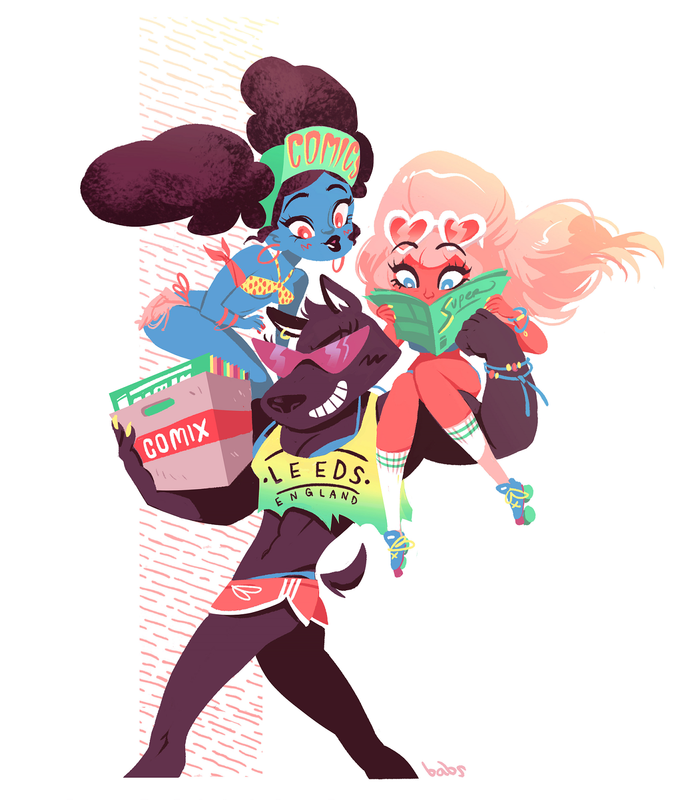 This year’s Thought Bubble will be taking place from 9th – 15th November at venues across Leeds (and beyond!) and will see legions of comics creators and fans travel from around the world to visit Yorkshire. For the first wave of information, please read on! This year’s official festival image can be seen below, and has been illustrated by the amazing Babs Tarr! We’ve been loving Babs’ art on Batgirl recently, and she’s brought an awesome L.A. beach party vibe to this year’s image! Look out for it gracing our anthology and festival programme later in the year. Each year we have the immense pleasure of welcoming some amazing creative talent to Leeds for the festival, and this year we’re hoping to see even more new faces coming to the city and helping expand the minds of the comics loving public, and those who’ve never even picked up a funny-book before. Our first wave of guests can be seen below, and we’ll be adding to this list on the website throughout the year, so be sure to check back regularly! We’ll be opening up our exhibitor registration on Monday 2nd March this year, and this application period will be open for two weeks until Monday 16th March – we’ll have another blog post coming with more details on Friday, and the registration form will go live on our website for potential exhibitors to complete on the date above. We saw some amazing talent at the convention last year, and we’re hoping that this year’s show will be our most diverse yet! On the banner above, you can see the dyslexia typeface we’ll be using on our print material for this year’s festival – provided by opendyslexic.org – we’re hoping this will make Thought Bubble’s programme more accessible and easier to read. We’re very please to be able to support the OpenDyslexic project, and we would highly recommend checking out their work, as it’s for a very good cause. As part of last year’s Thought Bubble, we were awarded a very generous grant from Arts Council England in order to allow us to take video recordings of the panels and talks at 2014’s convention, and we hope that this will get you in the mood for this year’s festival! We’ll be uploading lots of videos to our YouTube channel throughout the year, as 2015’s Thought Bubble approaches ever closer, so make sure to subscribe to our channel so you don’t miss any! You can find Thought Bubble’s YouTube channel by clicking here. That’s everything for now, but we’re going to be updating the website throughout the year as we confirm guests, exhibitors, and events! To find out as soon as this happens you can subscribe to this blog, follow us on Twitter (@thoughtbubbleuk), or like us on Facebook. We’ve got a lot of fun stuff planned for 2015, and we hope to see you soon – we’d also like to say a big thank you to everyone who supports Thought Bubble and makes organising it such an enjoyable and rewarding experience.